Riding equipment is another necessary part of riding. As with riding clothes the cost can quickly mount up, especially if you're lulled into spending lots of money on things that you don't actually need. Here's our guide to some basic riding equipment. There are many different types of saddle available, which can make choosing one confusing. A few of these are briefly described below. An English saddle is good for those who want to go hacking and attempt jumps that aren't particularly difficult (like negotiating minor obstacles on the ground). An English saddle is usually an all-purpose saddle that has cuts that are cut forward to make this easier. A dressage saddle has longer billet straps than the English saddle. It also has a deep seat, and its flaps are cut straight. This lets you sit deeper in the saddle, which offers close contact with your horse and greater control. A side saddle has a flatter seat than the previous two types of saddle. Its pommels are much more pronounced too, which lets you sit almost sideways on, even though you're actually facing forwards (you've probably got to sit in a side saddle for yourself to understand how this is actually possible!). Your right leg hooks over the head of the saddle, with your left leg slotting into a regular pose (your foot is in the stirrup). Some side saddles don't have a head at all. Some variations have what is known as a 'leaping head', which can give you some balance against the saddle's head while your horse is jumping. Antique side saddles don't always have a head or 'leaping head'. An Australian Stock saddle is more of a comfortable saddle, with deep seats. It has blocks underneath the pommel and on the back of the flaps on the saddle. This offers some stability if you're going to be riding on steep hills. Some of these saddles will have a horn that is usually not as thick as the Western saddle horn, and some types of Australian saddle horn have an over girth (but not all do). If you're very new to riding and don't yet own your own horse, buying a saddle isn't necessary. They can be a bit pricey, so it's best to hold off on getting one until you're seriously involved in the sport. This is another piece of essential riding equipment. 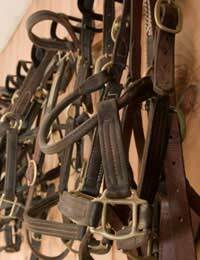 A bridle fits over the horse's head, and is needed so that you can control your horse. A 'bit' usually fits into the horse's mouth, and is held in place by the bridle. A 'double bridle' carries two bits. This is a piece of metal (or similar) that fits into the part of the horse's mouth where it has no teeth, and is locked in position by the bridle. It helps you to control the horse. These are also essential pieces of riding equipment if you own your own horse. A few of the most important grooming items include hoof picks, brushes and currycombs. These are the best items for tidying up your horse before you saddle up. See our article on 'Caring For Your Horse' for more information on grooming. These are more of an optional piece of riding equipment. Some riders like to use riding crops (small batons made from leather) to encourage their horse to move or go faster. During riding lessons, you'll usually have to get permission from your instructor to use them, as not everyone sees them in a positive light. These are also optional. They're metal 'pricks' that can be put on the heel of a riding boot so that the horse has a better idea of what you're telling it to do. They can be effective, but if they're not used properly, they can cause more harm than good. New riders are usually advised to concentrate on improving their leg muscles instead. New riders are often worried about the cost of buying riding equipment, but it doesn't need to cost a fortune. If you visit a tack shop, they'll usually try to sell you things that aren't actually necessary. You'll definitely need a saddle, bridle (and bit) and grooming equipment, but a lot of the other items available in shops are surplus to requirements for most riders.